Pet grooming refers to the maintenance of well-being and health of animals. Basic pet grooming products include shampoos & conditioners for bathing, clippers & scissors for nail clipping and trimming, and combs & brushes for hair cleaning. Other products include tooth paste to brush the teeth and massage oils to massage the pets. The pet grooming products market is one of the smallest but established markets with a consistent financial growth over the past decade. Rise in concept of pet parenting and increase in disposable income of pet owners are the major factors that drive the growth of the global pet grooming market. Consumers are now opting for high-quality pet food, high-end accessories, and a variety of pet grooming services for their pets, which further fuels the market growth. Moreover, mobile pet grooming services have witnessed increasing popularity across the globe, wherein specially equipped vehicles travel to pet owner’s residence providing full range of services at the doorstep. This eliminates the necessity to wait in long queues for pet grooming services. Thus, all these factors significantly contribute toward the growth of the global market. The pet grooming product market by type is segmented into shampoo & conditioner, comb & brush, clippers & scissors, and others. The market is dominated by shampoo & conditioner segment, as they are majorly used by pet owners. This is attributed to the fact that shampoos & conditioners are a specialized pet care products, which condition, cleanse, and deodorize the skin and coat of the pets. In addition, medicated shampoos are used to treat various skin-related problems and diseases. The most common pets around the globe are cats and dogs, who have a hairy coating, and hence often get soiled, due to wandering and lying on unclean surfaces and other outdoor movements. Moreover, they are prone to infections caused due to flea and ticks, which increase the risk of bacterial growth. Specialized pet products offered by manufacturers and rise in pet care awareness drive the demand for pet shampoos & conditioners. Pet owners recognize the need for safer and healthier product content, which further increases the demand for shampoos & conditioners. 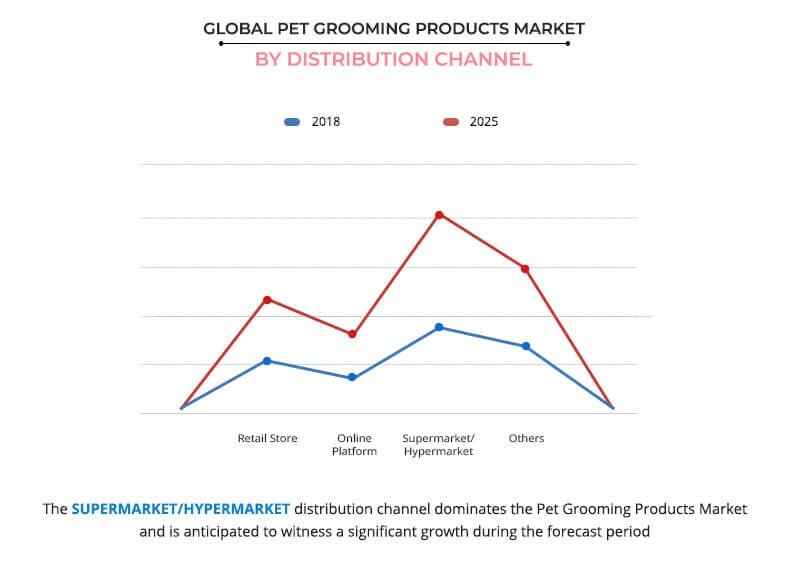 On the basis of distribution channel, the pet grooming product market is fragmented into supermarket/hypermarket, retail stores, online platform, and others. Supermarket/hypermarket offers a wide range of options for pet grooming products under one roof. The online platform segment is expected to witness highest growth during the forecast period, due to high penetration of internet & smartphones. Furthermore, development of the e-commerce industry significantly boosts the growth of this segment. Consumers prefer to buy pet grooming products from a trusted online platform, as it serves as a cost- and time-effective approach. A wide range of products from bedding, clothes, grooming products, toys to high-quality pet food, and high-end accessories are available online. Region wise, the pet grooming products market is analyzed across North America, Europe, Asia-Pacific, and LAMEA. 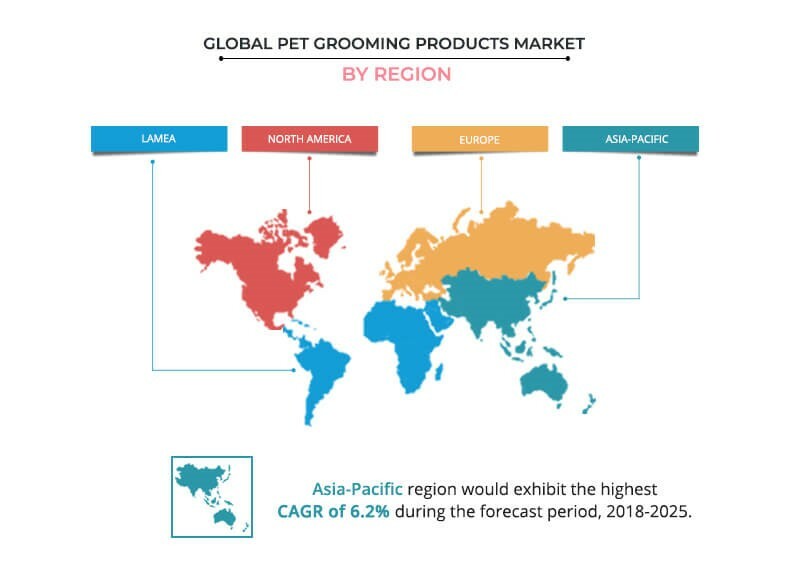 North America dominates the global pet grooming products market; however, Asia-Pacific and Latin America are anticipated to exhibit notable growth in the consumption of pet grooming products. More than half of the families in the U.S. own a dog, or a cat, or any other pet. In addition, increase in the presence of dog grooming parlors has been witnessed at different locations. Rise in per pet expenditure and increase in pet ownership are anticipated to drive the pet grooming products market in the North America region. However, in the Asia-Pacific region, increase in awareness about well-being and good health of pets augments the growth of the market. Furthermore, rapid urbanization in this region propels the market growth. Cats have become popular in Asia-Pacific, as they are suitable for independent and small apartments, and can be left alone for some time as compared to dogs. Key players profiled in the report include Ancol Pet Product Limited, Beaphar, Ferplast S.P.A., Johnson’s Veterinary Products Ltd., PetEdge, Rolf C. Hagen Inc., Rosewood Pet Products, Ryan’s Pet Supplies, The Hartz Mountain Corporation, and Wahl Clipper Corporation. 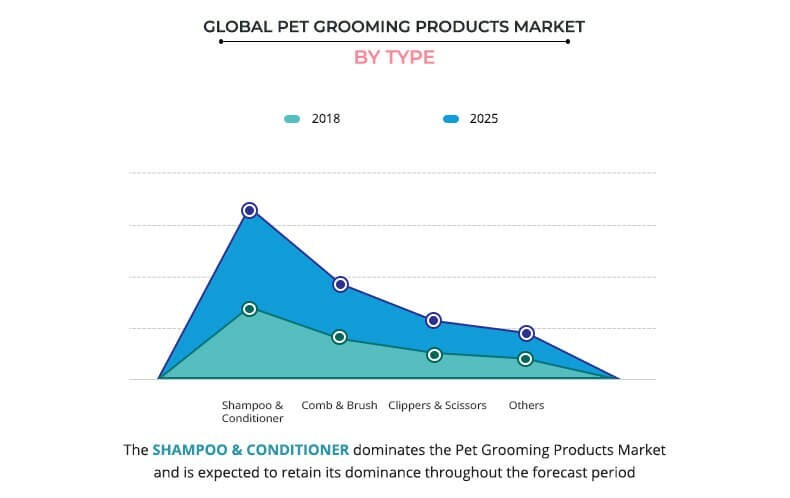 The other prominent players in the pet grooming products market include Pet Brands Ltd. (UK), Just For Pets Ltd. (UK), Bob Martin (UK), Petco Animal Supplies, Inc. (U.S.), and Groomers Delight (New Zealand). The report provides an extensive analysis of the current & emerging market trends and opportunities in the global pet grooming products industry. 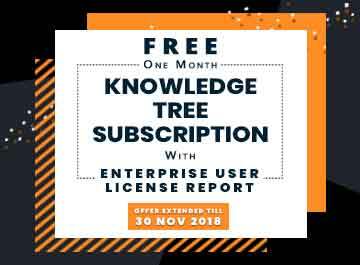 The report includes detailed qualitative and quantitative analysis of current trends and future estimations that assist to evaluate the prevailing market opportunities. 7.4. JOHNSON’S VETERINARY PRODUCTS LTD. Living with a pet aids in controlling stress and depression of an individual. Caring gestures such as stroking a cat or dog can lower blood pressure and make an individual feel calm. Thus, globally, more than half of the population owns at least one pet; dogs are the most popular pets followed by cats. Pet grooming refers to well-being and maintenance of health of animals. 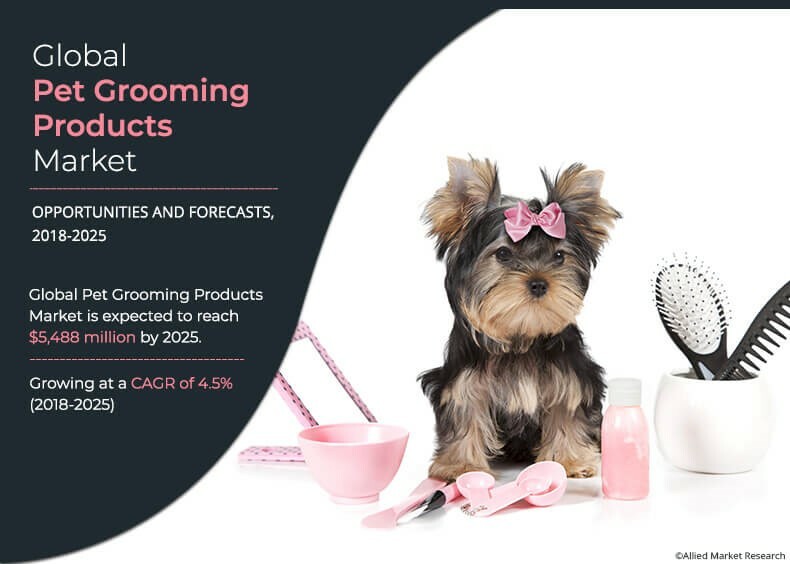 the global pet grooming products market is growing at a considerable rate, owing to increase in pet ownerships, rise in pet humanization, and surge in need for premiumization. Increased awareness for ethical treatment of animals and growth in humanization have improved the health and fitness of domesticated animals. Increase in pet population has led to rise in demand for pet grooming products and services. Moreover, Asia-Pacific and Latin America are projected to register a significant growth as compared to the saturated markets of Europe and North America, due to increase in adoption rate of pets, growth in disposable income, and shift in consumer trend, as consumers are moving from pet ownership to pet parenthood, treating their pets as family members.